Dangerous Advances in Measurements from Digital Subtraction Angiography: When Is a Millimeter Not a Millimeter? SUMMARY: Aneurysms need accurate millimeters (mm). Direct millimeters were lost with digital subtraction angiography (DSA) years ago, with measurements in pixels. Advances in DSA can now give inherent millimeters. The Cerecyte aneurysm coiling trial's angiographic core lab assesses images from compact disc (CD). External fiducials for millimeter calibration are required. Of 25 cases with two 10 mm fiducials, near and far from the intensifier, the midline mean is between 9 “mm” to 15 “mm”. Yet 10 mm must be 10 mm. This variance is potentially dangerous. Proprietary software seems to prohibit calibration transfer via CD to another vendor's system. Millimeter measurements are needed for management decisions and treatment planning of some vascular diseases. Surveying 2 recent issues of the American Journal of Neuroradiology gleaned reports requiring millimeter measurements from digital subtraction angiography (DSA).1–4 These included aneurysm sizes, necks, and devices matched to artery size. Despite the multiple advantages of DSA, the technology did not, and still does not, include a method of measurement that provides the same ability to measure in millimeters as earlier analog techniques did. C-arm DSA with adjustable intensifiers reduces tube distance and thus increases magnification. Intensifier positional variability and tabletop movements add to millimeter inaccuracy with variable magnification in different projections.5 FOV settings further complicate calibrations. There are challenges to calibrating “real millimeters” with different positions when scanning the same patient. Manufacturers did not develop millimeter adjustments for these complexities to achieve real millimeters. Only recently has the lack of real DSA millimeters begun to be addressed. Angiographic measurements are important for some diseases. CT angiography (CTA) and MR angiography millimeter isocenter calibrations are a new standard for angiography with cross-sectional imaging,6 improved over standard DSA. Because DSA did not give real DSA millimeters for decades, assessment of carotid stenosis degree became a percentage ratio,7–9 calculated from pixels. Percentage stenosis has multiple ways to determine denominators for calculation. Each is logical, yet different,10 yielding different percentage values from a given stenosis. The initial disparity of 2 endarterectomy trials was due to different results caused by different measurements.7–9 The threshold of “70% stenosis” for the European Carotid Surgery Trial (ECST) was “40% stenosis” with the North American Symptomatic Carotid Endarterectomy Trial (NASCET), and “85% stenosis” was 70% with NASCET.10 Measuring the narrowest diameter was not performed in millimeters, just pixels. Pitfalls for percentage stenosis continue, especially for near-occlusion recognition,11 and because of a lack of compliance for distal internal carotid artery (ICA) diameter as a denominator.8,9 Lack of real millimeters contributes to chaos in quantifying carotid stenosis. There is already a recommendation that real millimeters replace percentage stenosis6 in CTA. Intracranial aneurysm decisions are based on size, for treatment planning and outcome. Unruptured aneurysm size seems important.5,12 DSA removed millimeter measurements, with a lack of real millimeters early in the aneurysm-coiling experience. For the supraclinoid ICA, 4.0 mm was suggested for sizing aneurysms, despite limited validity,13 because it was expedient, despite a lack of accuracy. Every supraclinoid ICA is not 4 mm. There are anatomic variations of ICAs, vasospasm, and atherosclerotic disease. This 4-mm approach may have delayed demands for exact DSA millimeters with rapidly advancing endovascular treatments because it created little pressure on manufacturers for real millimeters. 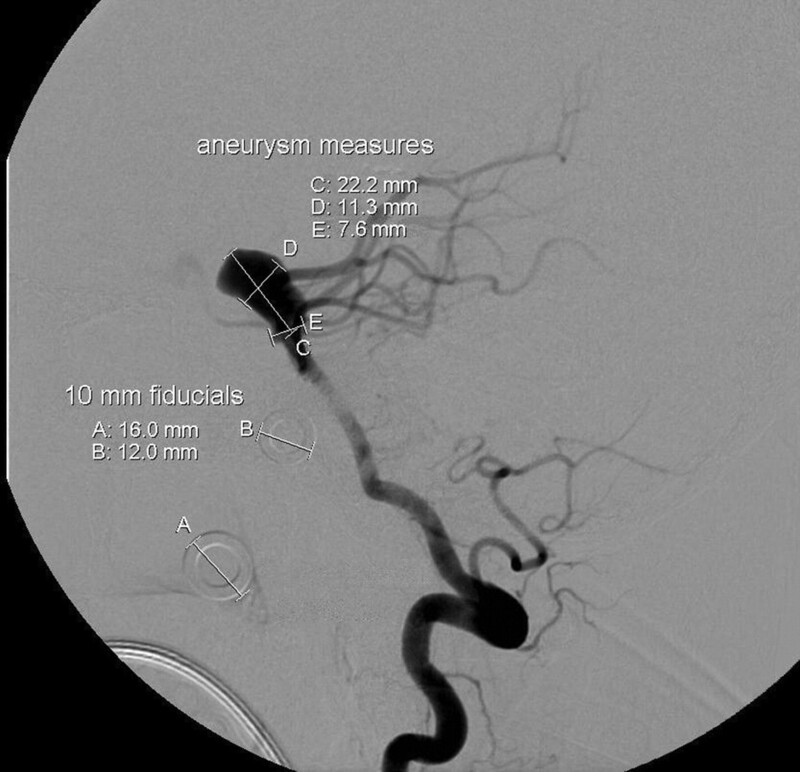 The International Study of Unruptured Intracranial Aneurysms (ISUIA) developed a millimeter conversion template to standardize aneurysm sizes.6 ISUIA organizers required standard millimeter conversion to combine aneurysms from different sites, projections, and studies. Fiducial markers14–18 with DSA are used for aneurysms, as well as carpenters’ washers, coins, rulers, ball bearings, fishing lines, and medical fiducials developed for stereotactic treatment planning with CT or MR imaging. Millimeter accuracy varies with the number of fiducials around the head,14 allowing calibration of the midline from near- and far-side fiducials. Angiographic images are unable to provide direct millimeter measurements with standard DSA. 3D DSA has a finite isocenter and acquisition geometry,19 similar to those in CT and MR imaging. Development of 3D DSA was really CTA from a C-arm, achieving calibration for accurate millimeters. Recently, some new neuroangiography machines offer what seems like “embedded” millimeters from standard 2D DSA. The Cerecyte Trial core angiographic laboratory (multicenter randomized coiling study) prescribes the use of external fiducials, seeking consistent aneurysm measurement. Some trial centers use both fiducials and advanced angiographic machinery with such embedded millimeters. The cases in those centers provided millimeters from both fiducials and embedded measurements. CDs with representative images were sent to the angiographic core laboratory of the Cerecyte Trial. All studies were entered into Impax (Agfa HealthCare, Mortsel, Belgium) in order to use the same measuring tools consistently for all subjects. Automatic image-launching software, included with most CDs for viewing, was not used. Of the first 73 cases reviewed, 40 had fiducials applied and millimeter values, instead of pixels, that appeared automatically when measuring images. These gave the unique opportunity to read millimeters from CDs with Impax as well as to use fiducials to calibrate images with known diameters. Each case was its own built-in control. Fiducials with a known 10-mm diameter on 2 sides of the head were available for 25 cases, with readings of 8.2–12.5 mm closest to the intensifier and 10.0–16.7 mm farthest away (Fig 1). Thirteen cases with only a single 10-mm fiducial had up to 18.5 mm recorded, and 2 cases with 5-mm fiducials had 3.6 mm recorded. Taking the mean of near and far fiducials, 10 mm at midline, and allowing a 10% variance yielded 68% with a mean for 10 mm in the midline as >11–15 mm. Only 32% showed appropriate millimeters, within 9–11 mm. Because there can be only 1 definition of millimeter, we call transferred incorrect millimeters “vendor millimeters,” imperfectly derived from vendor software. DSA millimeters depend on calibrations, as in CT and MR imaging, which have consistent isocenters and are internally recalibrated to adjust for system drift. New embedded DSA millimeters are subject to all the challenges that delayed millimeter development for decades, including the floating table, table height, distance changes between tube and intensifier/flat panel, and magnification settings within the imaging chain. If any factor changes, new millimeter calibrations are required when scanning a patient or millimeter readings will not reflect real millimeters. CDs from multiple participating centers sent to the Cerecyte core laboratory did not seem to transmit accurate calibrations to the PACS. Presumably, some DSA millimeter calibrations were not transferred with other DSA data. This observation is not unique to DSA, because it can be seen with CT or MR imaging CDs. This discovery confirms that DICOM data, supposedly a universal industry imaging language, is not so universal. Yet some vendors provide DICOM data to be read only by their proprietary software, which is far from universal. This feature may be an explanation for millimeters not being millimeters, with 10 mm measuring up to 18.5 mm. Millimeter calibrations are lost in the transfer, yet millimeter designations are still allowed to transfer without millimeter calibrations. Angiographers did without real millimeters for decades, and now there is new excitement with presumed embedded millimeters. For many years, the lack of millimeters was ignored by using estimations or “eyeball” measurements, or quasicalculated14 measurements for stenosis, aneurysms, and malformations. Fiducial use grew out of attempts for more objectivity. Manufacturers did not provide embedded millimeters, yet now we have these direct millimeter measurements. Vendors do not seem able to produce systems for dependable millimeter measures to account for all table, tube-to-head, and tube-to-intensifier differences; magnification settings; and transmit data with universal DICOM to be read by all. Some angiographers may believe that manufacturers have already solved all millimeter presentations, and that millimeters now come free. Vendor millimeters still need millimeter calibrations for each position of angiography whether for 3D or 2D DSA. Transmitting CDs to other systems needs all the information to be transmitted, including millimeter calibrations. The accuracy of the original DSA data at the time of angiography and treatment needs in-house validation. From descriptions of manufacturers of how direct DSA millimeters are produced, calibrations are needed for each new position and distance adjustment. External fiducials are safe as double-checks whenever millimeter accuracy is required, to verify that embedded millimeters are correct. Current vendor millimeters are useful marketing strategies, for which naive users might forget to do recalibrations, with new unexpected risks of incorrect measurements. There are potential risks of incorrect vendor millimeters. Incorrect decisions about whether to treat (for example, with unruptured aneurysms) could occur if millimeters are wrong. The size of a first coil or deployed stent could be too large, with a theoretic risk of rupture. Operators are vigilant in deploying devices and are prepared to stop, remove, and replace a device that it is too big. Moreover, each device deployment has some risk, especially thromboembolic. Additional extra maneuvers have more risk. The waste of these expensive materials is unfortunate. Volume calculations are important for aneurysm sizing20 as well as linear measurements; and volumes need to be based on accurate millimeters. In conclusion, current embedded DSA vendor millimeter calibrations for each position may not transfer via CD to other systems. Embedded vendor millimeters can be dangerous if wrong decisions result from wrong sizes or if devices are deployed that are too large. There is no confidence for CD transfer of embedded vendor millimeters. It seems safest for external fiducials to be used for DSA, to reaffirm calibrations whenever accurate measurements are needed. Vendors should block transmission of millimeters to CDs, unless they can ensure that calibrations will be universally readable. Lateral view of a basilar tip aneurysm shows 10-mm fiducials, with the smaller closer to the image intensifier measuring 12.0 vendor millimeters and the larger farther from the intensifier measuring 16.0 vendor millimeters, averaged as 14.0 vendor millimeters for midline. Basilar tip aneurysm measures 22.2 × 11.3 vendor millimeters with a 7.6-mm neck, correcting to 15.9 × 8.1 real millimeters, with a 5.4-mm neck. This work was from the Cerecyte Trial, organized by ONNRU, Oxford University, Oxford, UK, and was supported by a grant from Micrus Corporation. Paper previously presented at: Annual Meeting of the American Society of Neuroradiology, June 7–14, 2007; Chicago, Ill. Accepted after revision September 24, 2008. You are going to email the following Dangerous Advances in Measurements from Digital Subtraction Angiography: When Is a Millimeter Not a Millimeter? Should Modeling Methodology Suppress Anatomic Excellence?